Why do we leave cookies and milk out for Santa? After schlepping around all those toys, I don't think that's what he really wants. No, I'm sure what he'd really like is a beer. And my guess is that living at the North Pole, he drinks those hearty, thick, warm-you-from-the-inside-out kind of beers. 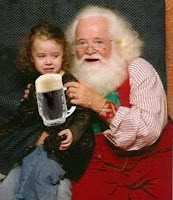 Who's to say Santa doesn't like beer? I bet Santa would be even jollier if the tradition was to give him a tall glass of Guinness and a slice of chocolate cake. Why not? Well, Jessica knows that I'm a beer aficionado (I brew my own) and with her passion for cakes -- she decided to make the two things happen at once. Yes, a Guinness Chocolate cake. Sound strange? It's really not. The recipe was from her cake bible, The Cake Book, and let me tell you, this cake is delicious! It's moist, has a subtle dose of chocolate, and perhaps just a tad bit of roastiness from the Guinness. It was such a hit, we've had 2 requests to make it again! Recipe has about 1 can of Guinness stout, cocoa powder, vanilla, and cinnamon. This was a double batch of cake (made in springform pans), then cut to give it rounded edges. Fondant was draped over top of the cake, leaving excess fondant around the edges. Then we flipped the cake over and used newspaper to hold up the excess fondant while it dried in place. The result was Santa's bag that we could stuff with toys. The rope is fondant painted with gold luster dust. All the toys are made from fondant, except the candy canes (which are real candy canes). And the best part about this cake? I get to drink the leftover Guinness. Cheers! To request a cake, send me a message at coopercakes1@gmail.com.